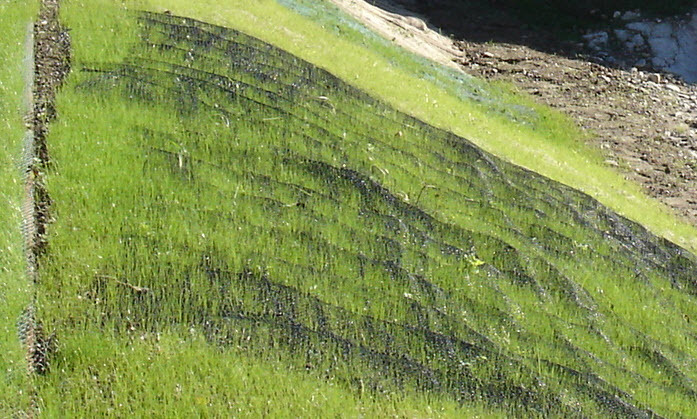 The three dimensional geomat in polypropylene, joins forces with VIRESCO the pre-sowed bio-textile so making possible the stabilisation of slopes, the settlement of the banks on the waterways and the grass covering of terrains up to 75° of inclination, which are not easy to regrass and are even more prone to instability. The VIRMAT three dimensional erosion control matting can be easily laid down just unrolling the rolls, making sure that it keeps in touch with the soil and anchoring it with pegs or U-shaped staples according to the amount of inclination. 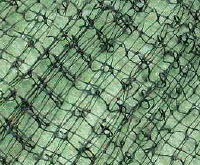 The VIRMAT structure has been designed so to guarantee a high erosion control standard and to firmly keep a layer of vegetable soil on the upper part. 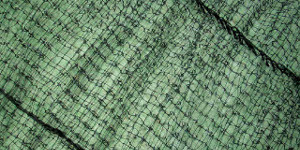 This way humidity and thermal protection are constantly supplied to the seeds which are enclosed in the underlying bio-textile. Contact us without obligation for a free estimate. You will receive our 5 free brochures: Erosion Control, Gardening, Horticulture! Provided data are collected, registered, stored and managed to allow to perform the supply contract and/or service conforming to the legislative decree 196/2003. At any time, the abovementioned data can be changed or cancelled. Virens s.n.c. as administrator is responsible for processing these data.